Biometrics authentication technology is now being used by blockchain-based cryptocurrency market. It is combined with blockchain technology to create new future market. According to foreign press and IT industries, a British startup called UNIKEYS commercialized world’s first cryptocurrency electronic wallet applied with biometrics authentication technology. This product hosts and stores various coins such as Bitcoin, Bitcoin Cash, ETH, and LTC through fingerprints. It prevents hacking attempts as it is stored with fingerprint sensors. When users register their fingerprints, this product guarantees high security through biometrics authentication technology. Its shape is similar to a normal credit card. Biometrics authentication element was co-developed by UNIKEYS and a company from Hong Kong. Also, UNIKEYS obtained fingerprint sensor technology from Fingerprint Card in Sweden, which is also preparing biometrics authentication card with Visa and MasterCard. 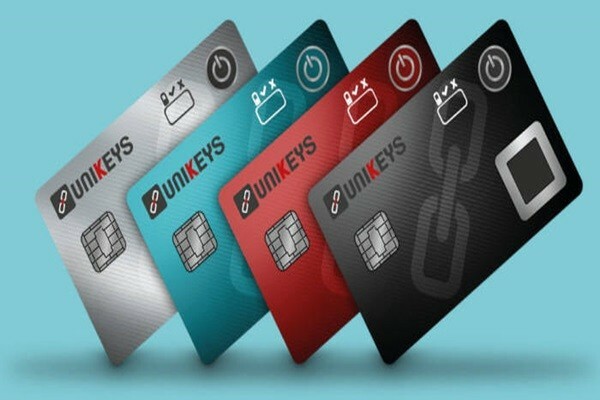 According to RFID Journal, it is heard that UNIKEYS is working on signing contracts with many foreign companies regarding purchasing products through its product. First pilot project will begin in Hong Kong. Global card companies that are paying close attention to cryptocurrency market have also greatly enhanced their R&D departments on biometrics. Visa, MasterCard, and Euro Pay are working on a pilot project for ‘fingerprint recognition card’ installed with fingerprint information. Visa started EMV dual interface payment card project with MACU (Mountain America Credit Union) and Bank of Cyprus. It is first pilot project that adds biometrics information into credit cards. MasterCard also completed its pilot project for biometrics authentication card last year and is preparing for commercialization. Besides a method that adds batteries into a card, it has also commercialized a technology that supplies electricity from a payment terminal during IC payments. Competition for biometric authentication technology between Smartphone manufacturers is also becoming more intense. It is heard that Apple is planning to apply both fingerprint and face recognition technologies into its new iPhone while Samsung included iris and face recognition into Galaxy S9. It is expected that amount of use of bio-authentication will be even higher as biometrics authentication technology is being used in various industries. One of the reasons why biometrics authentication industry is drawing so much attention is because it is considered as a safe security technology towards hacking and risk of personal information leakage as new services such as IoT-based FinTech, healthcare, and location-based services are becoming more popular. Fingerprint recognition is the most widely used biometrics authentication currently as it is relatively simple and inexpensive to implement. According to Korea Internet & Security Agency, fingerprint recognition is responsible for about 60% of entire biometrics authentication market. IHS Technology is estimating that fingerprint recognition market will be worth $17 billion in 2020, which is 4 times bigger than at the moment, as Apple and Samsung promote fingerprint recognition market. More companies are also beginning to adopt iris recognition technology based on its high security and accuracy.